Low level switch 1.5A, 250VAC. Motor 415 VAC, 50 Hz, 120W, 0.45 A. 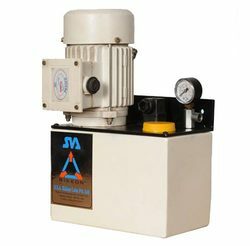 The Rikkon Lube Motorised Oil Pump Model SVM 50-T are 3 phase motor operated oil pump and are used for centralized oil lubrication system with metering units. The motor pump assembly is assembled on a steel angle plate cover provided with holes for side wall mounting. The oil pump is provided with a set of valves having vent valve to purge, release valve to release the pressure after pump stops and pressure relief valve open to avoid overpressure in the system. They are provided with suction strainer, low level switch, pressure gauge and strainer filler cup. These oil pump utilizes 3 phase motor for operating. These oil pump are available with plastic reservoir and metallic reservoir. Max output of 10 lpm with 50 ltrs reservoir capacity is available. These pump have in built Now return value, pressure relief value and pressure switch. These pumps are used for intermittent duty only. Looking for Motorized Oil Pump ?